Addressing the associations AGM, Bryan said farmers were angry by budget cuts announced by the minister. 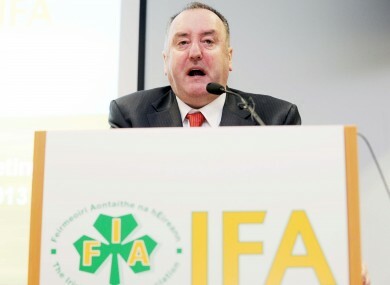 Image: IFA President John Bryan speaking at the AGM yesterday. THE PRESIDENT OF the Irish Farmer’s Association (IFA), John Bryan, has said that the decisions on the Common Agricultural Policy (CAP) will be crucial in deciding the future of family farms and the agri-food sector. He said farmers will hold the Agriculture Minister and the Taoiseach “directly responsible” for ensuring a successful outcome to the negotiations. “It is essential that the Taoiseach Enda Kenny works with traditional supporters of the CAP, such as France and Germany, to resist pressure for cuts to the budget by some Member States, led by Britain,” he said. Securing a fully finded CAP budget for Ireland would mean annual funding of €1.25bn for the Single Farm Payment and €350m for Rural Development. In a comment aimed at Minister Simon Coveney, the IFA President said he is totally opposed to flattening and regionalisation of the Single Farm Payment “as this will cause major disruption of payments at farm level and undermine production across all sectors and in all parts of the country”. Bryan said farmers were angry at the budget cuts announced by the minister last month and that Coveney’s claim of giving the same level of support to suckler farmers this year is “just not credible after delivering such a devastating blow to the sector”. “By cutting funding for farm schemes, including Sheep Grassland and with further cuts to Disadvantaged Areas, the Minister chose to hit the incomes of thousands of low income drystock farmers,” he said. The IFA President concluded by calling for the minister to re-visit the most damaging elements of the Budget for farmers. Email “Decisions on CAP will be critical for future of farmers - IFA President”. Feedback on “Decisions on CAP will be critical for future of farmers - IFA President”.